Effective representation in family law disputes is critical because these matters deal with the things most important to us: our children, our financial stability, and our future. As a whole, family law deals with family relations, including divorce, adoption, paternity, child custody, and child support. Any legal issue can be overwhelming, so retaining a family attorney who can explain the court process and make the process as easy to understand as possible is a good start. 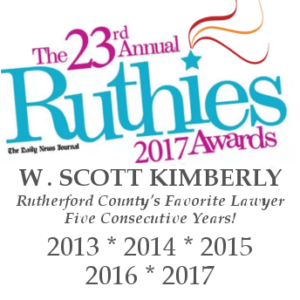 Scott Kimberly has helped family law clients in Rutherford County and Middle Tennessee for over twenty years. Scott will give you honest answers and straightforward thinking. How do I obtain a divorce in Tennessee? How do I respond if I am served with divorce papers? What costs will I incur during any court proceedings? How are marital assets divided between couples? How does Tennessee calculate child support? Should I seek a protective order if I am threatened? Which of the parties pays the legal fees? If you need answers to any of these questions, or if you have any other questions about family law issues, contact an experienced family attorney like Scott Kimberly and schedule a free consultation at a time that is convenient for you. Going through a divorce is one of the most emotionally volatile events that a person can endure. In the course of a few months, the parties will face decisions about housing, property division, parental rights, and more. There is nothing more important than making sure that children are protected; your assets and debts must be handled properly as well. At our office, we will sit down and listen to you free of charge so we understand where you are coming from. It seems unfair to to have to pay a lawyer before you and that lawyer have even discussed your case. A lawyer can only provide effective representation if they are willing to listen thoroughly to your particular situation. That is what we do. Child custody matters can be simple, when two parties agree to a child changing housing arrangements, or complicated, when child custody is hotly disputed. Sadly, in divorce proceedings, children are frequently used as pawns, where one parent tries to keep the children from the other based on nothing more than anger. Our office offers a complimentary consultation so we can determine exactly what you and your children need. Sometimes, custody matters don’t need much attorney involvement, and if that is the case, we will be honest with you about the situation. We want to identify your goals and help you achieve those goals in the most efficient manner possible. Child support is very common when a child’s parents live apart. The purpose of child support is to minimize the economic impact to the children when the parents live apart and, where applicable, to let the child share in the higher standard of living enjoyed by one or both parents. Unfortunately, child support can lead to several problems, including, most often, failure to pay. Our office can help you with any concerns you have about child support. We offer a free consultation, so we can discover what you need the most. Our firm can help you secure child support, represent you in any proceedings in which the child support is given, and help if you have child support payments that remain unpaid. An order of protection is a court order that can prevent someone from having any further contact with another person. Unfortunately, while orders of protection are certainly needed in some situations, they are often abused. For example, orders of protection are frequently obtained during a divorce proceeding for the sole purpose of gaining an advantage in the divorce or in child custody matters. If you find yourself in a situation where an order of protection has been issued against you, please give us an opportunity to review the order and listen to your version of what happened. An order of protection has several negative implications and, in Tennessee, it is suprisingly easy to obtain an order of protection; actual physical violence is not even be required! If you are in need of an order of protection, or if you have had an order of protection filed against you, and you would like an attorney to fight for your rights, contact us today for a free consultation.